The country now known as Ukraine was the center of the first eastern Slavic state called Kyivan Rus. During the 10th and 11th centuries, Kyivan Rus was the largest and most powerful state in Europe. Weakened by internecine quarrels and Mongol invasions, Kyivan Rus was incorporated into the Grand Duchy of Lithuania and eventually into the Polish-Lithuanian Commonwealth. The cultural and religious legacy of Kyivan Rus laid the foundation for Ukrainian nationalism through subsequent centuries. A new Ukrainian state, the Cossack Hetmanate, was established during the mid-17th century after an uprising against the Poles. Despite continuous Muscovite pressure, the Hetmanate managed to remain autonomous for well over 100 years. During the latter part of the 18th century, the Russian Empire absorbed most of the Ukrainian territory. Following the collapse of tsarist Russia in 1917, Ukraine achieved a short-lived period of independence (1917-20), but was re-conquered and endured a brutal Soviet rule that engineered two forced famines (1921-22 and 1932-33) in which over 8 million died. In World War II, German and Soviet armies were responsible for 7 to 8 million more deaths. Ukraine is also the site of the 1986 Chernobyl nuclear disaster, which continues to have health impacts in the region to this day. Ukraine achieved independence in 1991 with the dissolution of the USSR, yet political turmoil continues and prosperity remains elusive. Fighting broke out in eastern Ukraine in 2014 after the country’s pro-Russian president was ousted. The Crimean peninsula was seized and annexed by Russia as a result. The conflict remains unsettled. Ukraine has long been a global breadbasket because of its extensive, fertile farmlands and is one of the world’s largest grain exporters. 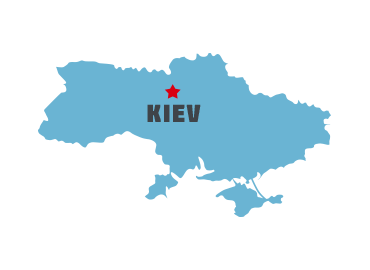 The diversified economy of Ukraine includes a large heavy industry sector, particularly in aerospace and industrial equipment. Ukraine also has the distinction of allowing the most freedom for evangelical churches of all the former Soviet countries. SGA supports the ministries of missionary pastors and biblical training through Irpen Biblical Seminary. We also serve the church based children’s ministries—Orphans Reborn, summer camps, Immanuel’s Child, and Youth IN Ministry. We assist with Compassion Ministry, and provision of other humanitarian aid as needed, especially in the war torn eastern regions of Ukraine. While Pastor Pavel Dudka’s church is located in western Ukraine, the people in his region are still affected by the war and bloodshed that is taking place in the eastern regions. Churches across Ukraine have been reaching out to refugees and other needy families, and God is using this troubled time to draw many to Himself. Pastor Pavel recently shared a wonderful account of how even city officials are open to hearing of Christ’s love. SGA partners are helping to equip youth groups as they are discipled by their local youth leader, and using their gifts to minister in their communities, sharing the Gospel.